Hi, so nice to speak with you again! I hope things are well. I’ve been doing a quick check in with myself this month. If you’ve been joining me, how has yours been going? Your questions, the bigger picture things that are important to you, may not be the same as mine, but it’s more about the process. For me, I process through writing. So writing the posts this month has been a big part of my check in! Maybe your preference is to chat about it with someone else, or to think about it while doing some sort of activity, like taking a walk or a few minutes on a trampoline. Knowing what works well for you a great first step. Am I Feeling Open and Connected? For me, feeling open is about being open to what’s happening around me. That means being aware of things, letting them penetrate my consciousness, not “in one ear and out the other.” And not rejecting things without some consideration and thought. Open to people. To ideas. To conversations. To activities. This week I’m asking myself if I’m feeling good about the support I’m giving my children’s interests. And my husband’s! Because we’re an unschooling family. Am I Exploring and Learning Too? If you’d like your kids to live an engaged and curious life, then live an engaged and curious life yourself. Am I Considerate of Others? We are each on our own journey, continuing to amass experiences and learn from them. Our differences are most often a matter of perspective. I can be considerate rather than judgmental. I’ve been writing my most recent blog post over the last few days, sharing a dojo story from a couple of weeks ago and last night, there was another interesting moment! It’s part of the whole perspective of others and being open and considerate, so I thought I’d share it here. I find these connecting moments so fascinating, the opportunity to see the perspectives of others. We waited a beat and then she moved on, leaving me to read my book and watch the young adults enjoying open class fun on the floor. It wasn’t the moment to bring up the finer points of how “play is the catalyst for amazing learning.” But now she has heard ipad, playing, and learning in the same conversation. Maybe sometime soon she’ll notice it: “hey!” And even if she doesn’t make the play-learn connection any time soon, in the conversation I felt her bump up against the recognition that she wants to learn. Though her current school-learn perspective led her in that moment to conclude that school is her best option, this glimpse of other possibilities helped her realize that school is a choice. And in knowing that she’s choosing school, maybe she’ll hate it a little bit less. Maybe her next day will be a little bit brighter. I love open and connecting moments like that with people! Last month I mentioned my upcoming book and I thought I’d give you a quick update. 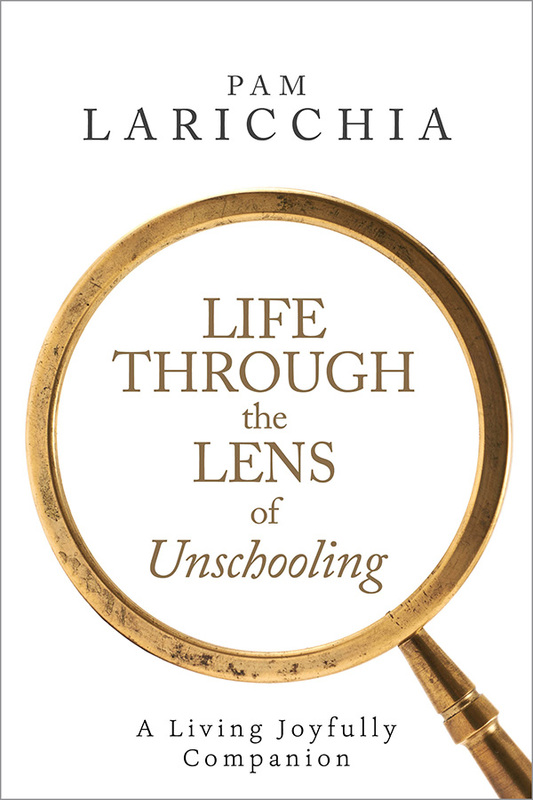 It is still titled Life through the Lens of Unschooling: A Living Joyfully Companion. The editing is finished and the cover is done. I’ve been formatting the print edition this last week and ordered a proof copy last night. That’s very exciting for the author in me! And, I will be officially launching it at the Always Learning Live Unschooling Symposium next month! It’s in Rochester, Minnesota, May 29 – June 1. The first print copies will be available there, as well as the ebook edition. And I’m dreaming up some fun stuff too! If you live within traveling distance of Rochester and haven’t yet registered, you may want to consider it. I love the description: “Light and cheery discussions of very serious things,” with, at this particular event, myself, Sandra Dodd, and Alex Polikowsky. Wishing you a lovely week of living and learning with your family!